TABU decals finally arrived last Friday and I have started applying them over the weekend. Yellow strips are quite challenging to get straight. And I could not completely achieve that. I am also not 100% happy with accuracy of TABU decals. Quite a number of them are done with over sized fonts. And some are bigger then they should be according to my references. Decals provided in the kit by Ebbro actually look more accurate in that respect. 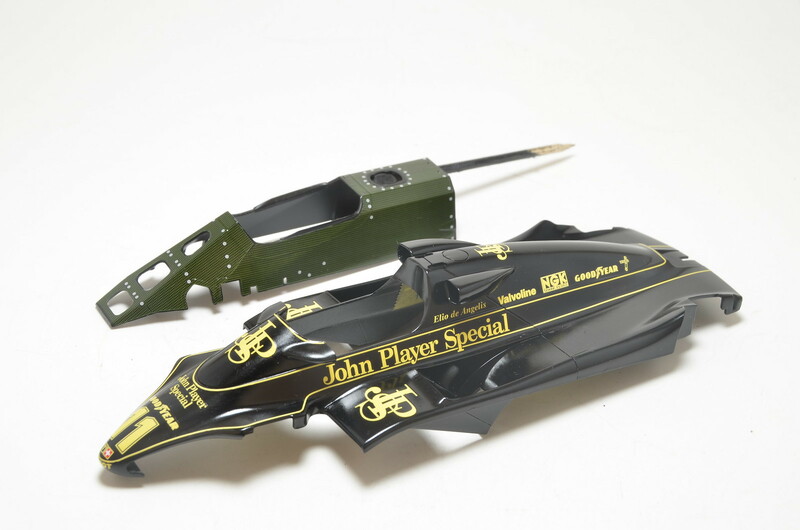 However I wanted to get JPS livery on my model and could not use decals from the kit. Also black on kit decals does not match my TS14 paint for whatever reason. Mixing up TABU and Ebbro decals was not possible either, as they use different shades on yellow. Pin stripes on side boards will be even bigger challenge, as it is not clear how the sizing of two rectangular outlines could be determined. Have to think about that and come up with a solution. 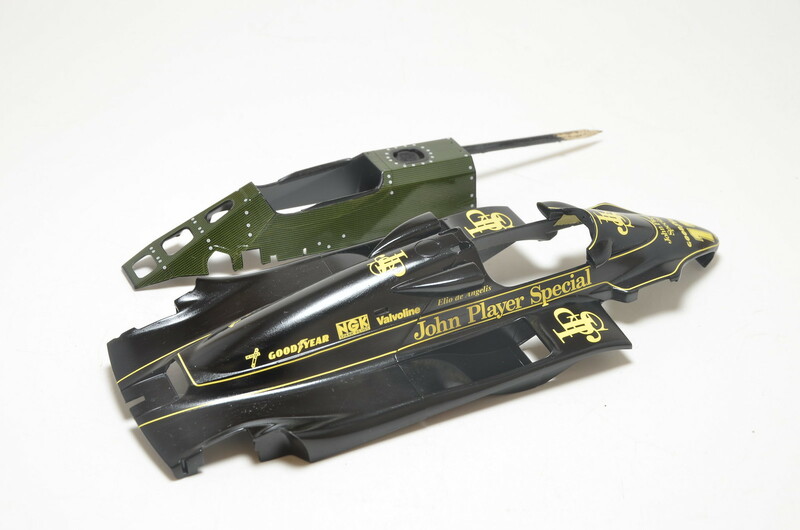 I have also applied CF decals from the kit to upper part of monocoque. I think it looks too greenish like that. My plan is to put some smoke clear over them to achieve more realistic look. Below are some quick shots of where I left of. Work continued on Lotus 91 build in mean time. 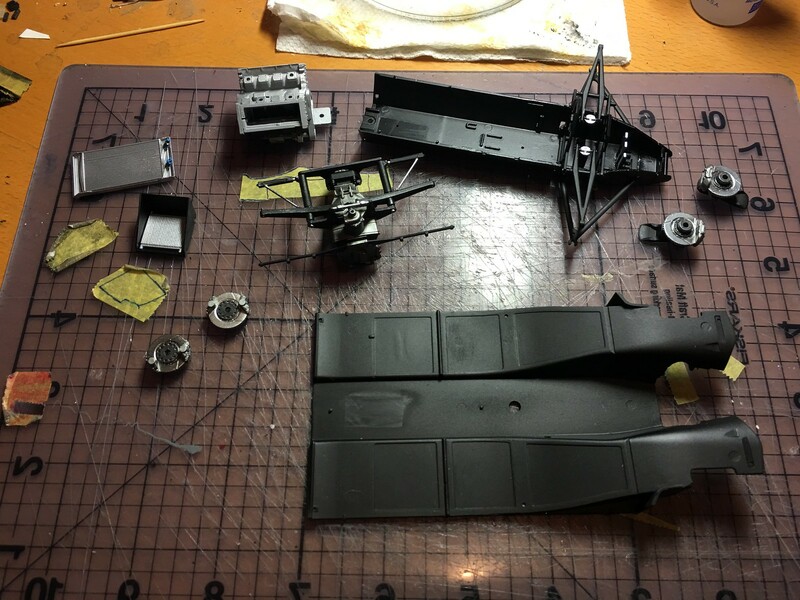 There wasn't much to show, as it was all prep work, priming and painting of various parts. Another major blocker are decals. I have ordered a full TABU set from HLJ and it has not yet arrived after 2 months of waiting. First time issue with shipping from HLJ. Most likely it is Canada Post's fault, but I ended up ordering another set from fat frog. Almost all painting is done by now and I was able to start some assembly steps. Started with engine and suspension parts. I will have to deal with CF decals over monocoque and seat belts, before I can continue much further. As soon as decals arrive, I will be able to start working on main livery, though. Here are couple of quick shots of the progress.